A ‘T-mobile’ repeater was destroyed by fire. All effort was made not to endanger any life and the mast was chosen due to its distance from residential buildings and activity. The fence was cut with bolt-croppers and placed at the base of the antenna, wrapped around the electrical cables powering the mast, was a cut tyre filled with rags soaked in paraffin. Soaked rags were also tied to the cables and tucked into the tyre. Firelighters were used to ignite the lot. The antenna was situated near the central Temple Meads railway station close to a new ‘urban development’ area. Destructive acts against the telecommunications infrastructure of capitalist economy are simple and reproducible, as are attacks against other facets of industrial society. The system relies on a network of cables, antennas and power units to enforce and sustain its exploitation. Far from being a faceless abstract enemy, the conduits of commodity production remain attackable at many points, vulnerable to our courage, rage and joy. We dedicate this action to the arrested anarchists Constantino, Luca and Silvia in Switzerland, accused of conspiring against a nano-tech facility; to all the prisoners of the social struggle in Greece and to all those who have begun to fight, in a myriad of places, of different tongues, races and names. We take responsibility for the attack on the communications mast on Dundry hill on 11th April, that took out five communication services and took off air BBC Radio Bristol and Jack FM for more than 16 hours, as well as disrupting Avon and Somerset Police radio communications it seems (although they are refusing to comment on this). We did this by stuffing two tyres with rags and methylated spirit, jamming them in the bundles of wires at the bottom of the mast and then igniting them. It was our pleasure to demonstrate that with modest ability and ample will we can create a rupture in ‘business as usual’. We want to interrupt the spectacle of the mass media, and the administration of the technological-information society. These radio stations and the media in general enforce the interests of the ruling class – the state and corporations. Propaganda masquerading as ‘objective news’ comes ad verbatim from government and corporate sources, and listeners get blasted with a tidal wave of adverts worshipping commodity lifestyle. Any criticism of the status quo is allowed, as long as it occurs within certain parameters, taking capitalism and civilisation as given, and entrenching the idea that these are inevitable. These criticisms, drained of any vitality, actually help maintain the existing order by making it appear tolerant. Genuinely revolutionary ideas are met with violent repression, as in the recent case of the anarchist counter information websites Culmine and Parole Armatein Italy. Every repressive blow deserves an answer. Mass media is the enemy of all rebellion and of every attempt to create a free life. The media is just one tool of modern alienation. Technologies such as mobile phones and online networks have become so all-pervasive that other more meaningful forms of communication have been undermined. We are increasingly atomised and connected to each other through the mediation of mass electronic devices. The technological-information society makes it easy to bury yourself in obsessive updating, reality TV, ‘social media’, popularity games and whatever gets handed down to blot out a way of life which hinges on control and exclusion. Faced with all this, we aren’t bought off as accomplices to an impoverished society that is collapsing the ecology which hosts us on this planet, and we reject the endless slide show of media revelry. This was our torch of solidarity to; Luca Abba (injured whilst resisting the military-style occupation by police thugs in the Susa Valley) and the 25 arrested across Italy fighting against the high speed train line construction; the jailed eco-sabateurs Braulio and Adrian in Mexico along with Sadie and Exile in the US; and members of the Greek revolutionary organisation Conspiracy of Cells of Fire (who are now threatened with having their sentences lengthened) and the others accused in their case. The relatively simple and repeatable action, like many of the attacks carried out by FAI/ELF, used methods anybody could research and execute. 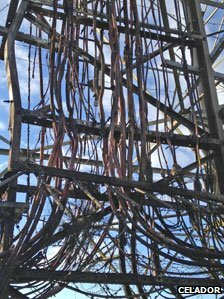 The attacks against the communications masts are done by burning the transmission conduit wires from the mast to the generator.